Last week we decided to spend the first part of Spring Break in Austin. Jennifer needed to have a meet and greet with some of the distributors of the product she’s selling, so me and the girls decided to tag along and make it a mini-vacation. 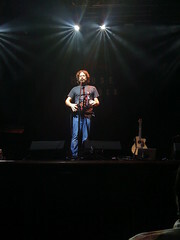 First though, was the Jonathan Coulton concert on Friday night before our vacation. For those of you who don’t know who JoCo is, it’s kind of hard to describe his type of music. It’s kind of folk music with a humorous geeky twist. It’s best to just go to his web site and listen to a few of his songs. The concert was great, very funny and entertaining. Can’t wait for him to swing back this way. The new House of Blues was a great venue. My only complaint was that it cost $7 for a small 12 oz. can of Shiner Bock. Sunday, we packed up and headed to Austin. We used Priceline in order to get $65 / night hotel rooms at the Hilton near the Airport. It was a very nice place, even though it was near the airport, and kind of far away from most of our destinations. We visited with a few of my old co-workers and ate at some of restaurants that I missed (Rudy’s & Chuy’s). Monday, while Jennifer was meeting with one of her distributors, me and the girls were dropped off at the State Capitol building. 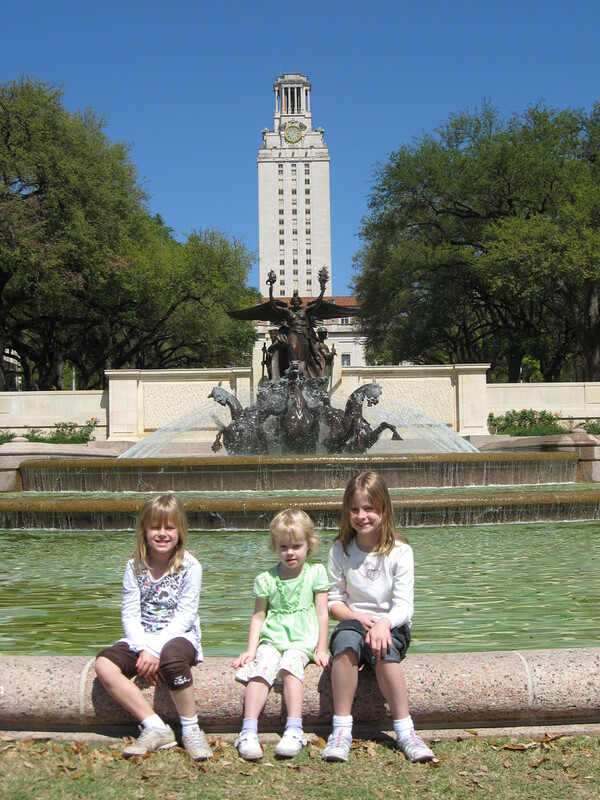 We wandered around and then headed up to the University of Texas campus to take a few sites in. We stopped by Dobie Mall to get something to drink. I was amazed that it hadn’t changed in the thirteen years since I’ve been there. On Tuesday, we drove down to Natural Bridge Caverns. Abby has really been into geology lately, so we wanted to take her there so that she could see all the different rock formations. All the girls enjoyed it even though it was quite a hike. Afterwards, we were all tired and piled back into the Sequoia and headed back home. This was a momentous week because it marked Jennifer’s return to the workforce. We signed the girls up for day care and so it was a little nerve wracking making sure Abby and Emily knew they had to ride the bus from school to the day care. Abby said it best when she said she was both nervous and excited. I told her there’s a word for that: anxious. Everything went fine they made it to day care and Izzy’s getting used to new friends to play with during the day. 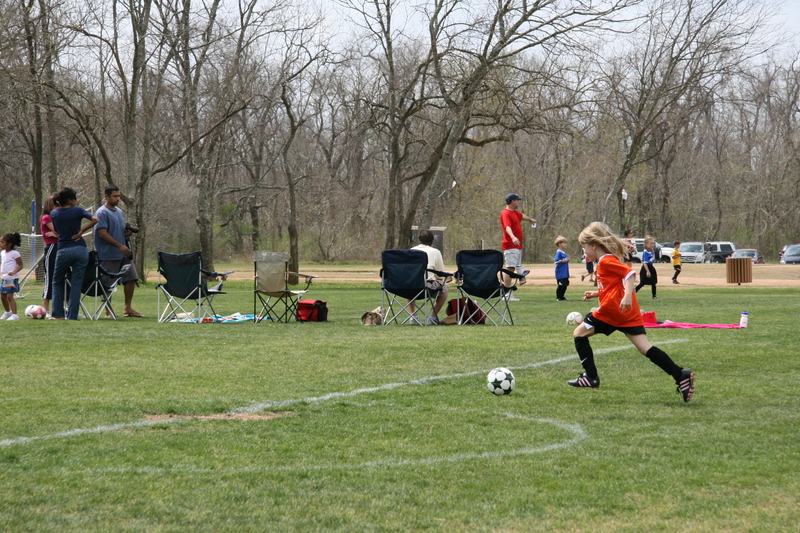 Saturday also marked Emily’s first soccer game. When you are in Kindergarten, it’s three-on-three with no goalie. So, it’s was pretty simple. Emily could really run, but she always hesitated getting into the middle of the fray. She got a few good kicks in and they ended up winning 9 – 5. At the end of the day Emily asked me why today was different than the other days she went to soccer. She didn’t really get the concept that that was a game and that they were playing another team. It was pretty cute.